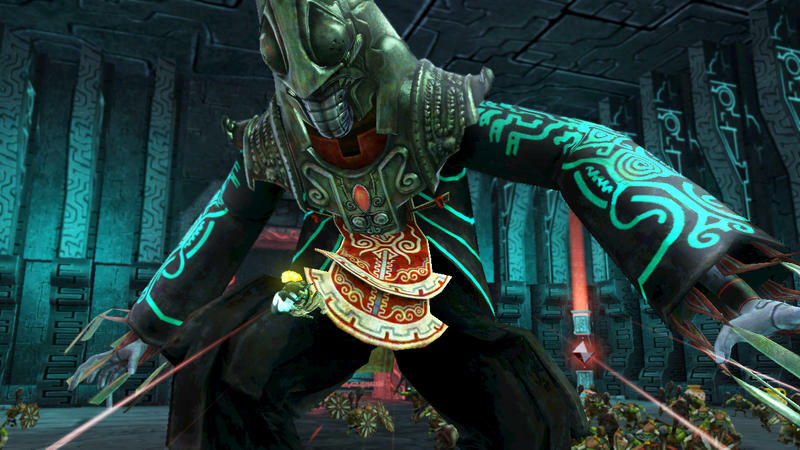 Ganondorf isn't the only Legend of Zelda villain you'll be able to play as in Hyrule Warriors. While they might be mere specs on his massive legacy, The Skyward Sword's Ghirahim and The Twilight Princess' Zant also tried to bring ruin at one point in Hyrule too, and they'll be joining him on the battlefield in Team Badguy as playable characters. Ghirahim's technique comes off also as something straight from traditional board games. You know, the kind we played before this whole idea of electricity came to be. His moves erupt particle effects resembling spades, swords, and diamonds from a typical set of trump cards, and even more telling is the grid like area of effect attack which looks like a chess board variant. He also features the ability to transform into a black being riddled with digital marks, granting him the power to teleport attack more swiftly than his normal form. Man, I need to bite the bullet and push through The Skyward Sword. It's just so hard to remain interested in that one. In the opposite corner from the fabulous Ghirahim, we have Zant from The Twilight Princess, who can only be described as mix between a grasshopper and a chimpanzee. His fighting technique involves flailing his wild arms around, ripping apart the enemies with his long claws and hidden scimitars up his sleeves. His dark magic attacks lay waste to enemies as well, and his ability to summon stone pillars from the ruined desert sands is cool. He certainly is an odd beast. Man, I need to bite the bullet and push through The Twilight Princess. It's just so hard to remain interested in that one, too. With these two confirmed to be playable characters, expect further announcements regarding playing villains or word of mouth from Japanese gamers since the game launched today. Hyrule Warriors will be released for the Wii U on Sept. 26.